It's all been very war-ish today. If it's not metal monstrosities firing explosive anger at each other, it's cheerful cartoons scrapping across hovering mobile battlefields. That's the premise for Wildstar's Warplots mode. As explained by the trailer, it's a 40 vs 40 PvP showdown, in which two sides fight it out over their player-made plots. Warplots are awarded to players when they hit level 50, and enter the Elder (read: end) game. Players will be able to customise their plots with weapons, traps, teleporters, orbital cannons and monsters captured during dungeon runs. They can then pit that warplot against others, with the winner of the 40-a-side battles gaining PvP rewards, and the loser losing their upgrades. It sounds like an enjoyable and somewhat different take on high-level PvP. 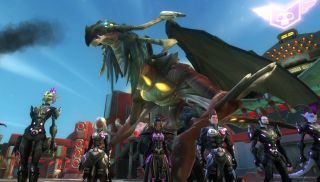 Chris was already charmed by Wildstar's player-versus-player battles, and hopefully that same skill-based fluidity will neatly expand to the much bigger scale. Wildstar is out June 3rd.